Elian Gonzalez, the 6 year old boy at the center of the international battle for child custody, and contention between the U.S. and Cuba, has recently resurfaced into the spotlight, sparking new debates. Controversial, accidental international political celebrity, Elian Gonzalez recently resurfaced after almost two decades, now a young man with opinions many Miami residents may find surprising. In 1999 the Miami press, and streets were taken by storm in an international immigration and family custody dispute after Elian’s mother attempted to flee Cuba with her young son. Elian’s parents split when he was just 3 years old. In an attempt to escape the Cuban regime his mother Elizabeth Rodriguez, fled the country by boat. After engine trouble and taking on water in a storm, the party of 10 wound up in the water. On Thanksgiving Day two Florida fishermen rescued Elian from the water, 60 miles north of Miami, off the coast of Fort Lauderdale, FL. Elizabeth Rodriguez had lost her life trying to save her son. The boy was united with his relatives in Miami. However, the rejoicing was short lived, and an intense legal battle followed. Elian Gonzalez’ cousin Marisleysis Gonzalez, and great uncles Delfin and Lazaro Gonzalez hoped to see Elian’s mother’s wished for her son realized. However, the boy’s father was quick to insist on his son's return to Cuba. The following days saw political and media turmoil, armed law enforcement raids and chaos in the streets of Miami. 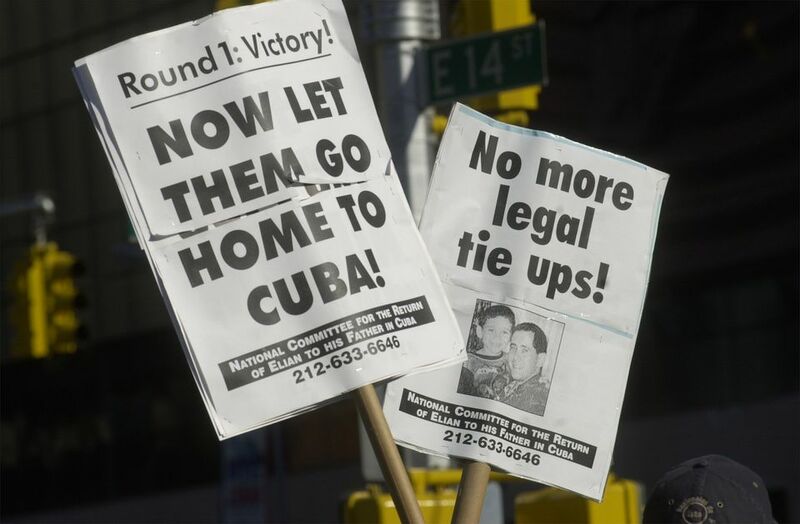 Custody appeals between Miami family members seeking to gain political asylum for Elian and his father Juan Miguel Gonzalez who demanded he be returned to Cuba quickly scaled to the highest courts. Complaints were made to the UN, Circuit Courts, Supreme Courts and Federal Courts were all involved, as were Attorney General, Janet Reno, and Vice President Al Gore. Heated voices were raised on both sides, with protests breaking out on the streets of Miami. Elian’s Florida family members peacefully refused to voluntarily give the child up to be taken back to communist Cuba. A pre-dawn raid involving 130 INS personnel, and 8 elite, Border Patrol agents armed with sub-machine guns resulted in Elian Gonzalez being forcefully withdrawn from his Miami home. The result in Miami’s Little Havana neighborhood included businesses closing in a boycott, burning of tires, and police in riot gear using tear gas. March 30th, 2000 Al Gore supports new legislation to keep Elian in the U.S.
After 14 years out of the spotlight, with the exception of birthday visits by Cuban Leader Fidel Castro, Elian Gonzalez emerged in the international media again in late 2013. Accounts of recent interviews with Elian demonstrate significant disparity in the media, and for many, perhaps a very unexpected outcome. According to Huffington Post coverage Elian says he has deliberately avoided media attention. In his first excursion out of Cuba since the event Elian spoke at the 23rd World Festival of Youth and Students in Ecuador at the end of 2013. According to E News Elian Gonzalez said of the custody battle events “It hasn’t affected me.” However, Miami Herald coverage paints quite a different picture, and quoting Elian as blaming the Cuban Adjustment Act, and Americans for his mother’s death, and the 1966 ‘Wet Feet, Dry Feet’ law for Cuban’s risking their lives in search of safety and freedom. Describing the law as “murderous,” Elian emphasized his nation’s struggle against the American government, and the people who called for him to be sent back to Cuba. It’s unclear what is next in the Elian Gonzalez saga, though many expect his captivating celebrity status, at such a young age positions him to become a high profile, and influential political figure in the future.